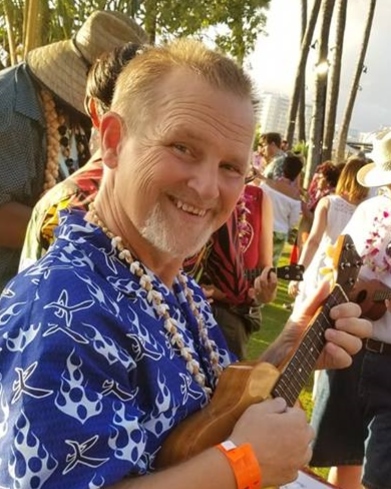 Samuel John Stone II passed away peacefully surrounded by his loving family on August 18, 2018, at the age of 58 after a long battle with prostate cancer. Born September 14, 1959, to Sam and Patricia Lee Stone, Sam II was the youngest of three siblings. He grew up primarily in Payette, Idaho, graduating from Payette High School in 1977. He went on to study Music Education at the College of Idaho, graduating with a Bachelor of Arts in Music Education in 1981. He later went on to earn his Masters in Educational Leadership from the University of Idaho in 2007. While attending the C of I, Sam met the love of his life, Tricia Willmorth. They married on June 1, 1985, and from that union came three sons that he couldn’t have been prouder of. In Spring2016, Sam became a grandfather to Ernestine Fae, who would become the light of the remainder of his life. Sam served the teaching profession in a variety of leadership roles. He was an active member of the Idaho Music Educators Association, and represented Idaho in what is now known as the National Association for Music Education. Sam was District III Music Educators Band Director of the Year 1999-2000, Caldwell High School’s Teacher of the Year 2000-2001, and Caldwell School District’s Teacher of the Year 2001-2002. Besides being an extraordinary teacher, Sam was a musician. He was never happier than when he was playing music with his friends. Most recently, Sam was a devoted member of the Treasure Valley Swing Band and the Valley Shepherd Worship Ensemble. Sam loved his family and his friends with his whole heart. He will always be remembered for his genuine and caring smile, and his big, warm hugs. Sam was preceded in death by his father, mother, and sister, Kristi. Sam is survived by his wife, Tricia, three sons Sam III (Jessica), Matt (Katie), & Eric (Natalie), and one granddaughter, Ernestine, as well as his sister, Michelle Lamm. The family of Sam Stone is humbled by the outpouring of love and support that was shown to Sam. Thank you to the doctors and nurses who took such good care of Sam and the Heart and Home Hospice folks who helped all of us navigate the final months of Sam’s life. A Celebration of Life will be held on Saturday, August 25th, at the Caldwell High School Auditorium at 10:30 a.m. Condolences may be shared with the family at www.dakanfuneralchapel.com.